Watublapi is a traditional village in the mountains and can be reached after a half-hour drive from Maumere. On the way to Watublapi we are passing small rural settlements and overlooking mountain slopes and valleys and terraces with agricultural land with mit cacao, peper, peperoni, vanila, cashew & manga trees and planty of coconut palms. In Watublapi we will take part on a traditional welcome ceremony and a stunning demonstration of some of the traditional dances accompanied by music "gong waning". Then the elaborate process of Ikat manufacturing (weaving) will be demonstrated. The Ikat or thread coloring is an old Indonesian technique. Young and old women weaving the Ikat can be seen in many villages on Flores. 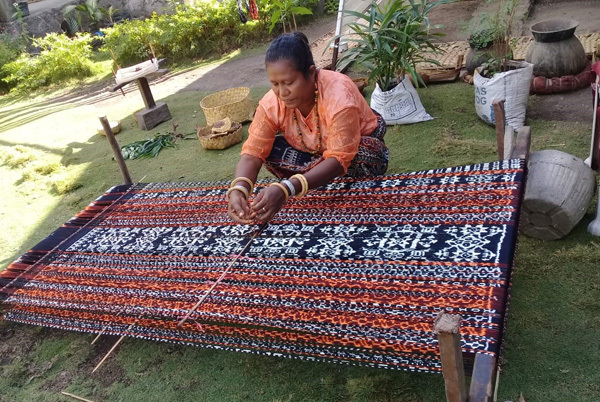 The Ikat weaving on Flores comes originally from the Sikka region on the South coast of Flores and it is par excellence the only arts and crafts on Flores. The Ikat patterns are determined by traditions and are handed over from generation to generation and the weaving process is still accompanied by mythical performances and ceremonies. The Ikat technique is that the cotton is stretched on a frame made of bamboo and according to the desired pattern bamboo raffia is tied or wrapped around the cotton and cut off just behind the node. Then start the dyeing and the bound places get no coloring. For multiple colors the process of wrapping and dyeing must be repeated several times. This means a huge amount of work which takes weeks, months and sometimes even years. How often an Ikat sarong hast undergone the process on binding off and dyeing make the Ikat more valuable. Traditionally, the colors are different shade of blue and brown color. The Indigo blue is obtained from the leaves of the Indigo plant and the brown colors from the roots of Kebuka tree. Beside to the traditional Ikat, where the cotton still is spun by hand and only natural dyes are used, today often chemical dyes and synthetic fibers' are used. After the design work of tying and dying is finished the threads will be put on the loom for weaving. Weaving itself takes at least another 4 weeks depending on the size of the cloth. The Ikat sarong belongs in the villages still to the everyday clothing of the women. In the cities and among young people the Ikat is more and more supplanted by European clothing. But still the Ikat cloths are a valuable feature for festive occasions and for the Sunday church attendance. 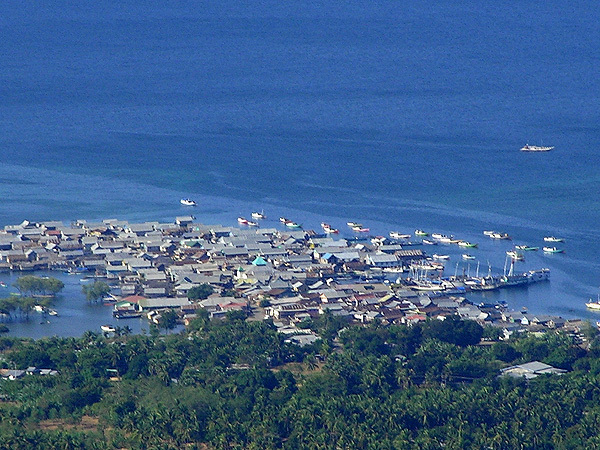 Still an insider tip is to do boat day excursions to the Islands in Maumere Bay Pulau Pangahbatang, Pulau Babi and Pulau Parmahan. Enjoy beautiful snorkelling sites, picnic and relaxing on white sandy beach and meet friendly people in picturesque fisher man villages. With little bit luck we can see dolphins on the boat trip. Where to stay in Maumere Bay ?